September has been an exciting month. Alison and I learned we received the large grant from ArtStarts in Schools for the Taan's Moons project! Yay! So preparations went full swing. We invited the children to make a drawing of the story and we made sure to jot down notes on what the children verbally expressed about their drawings. The visit to the classrooms and meeting with the teachers was very helpful in many ways. It gave us a sense of the dynamics of the class and the interest and attention levels of the children. 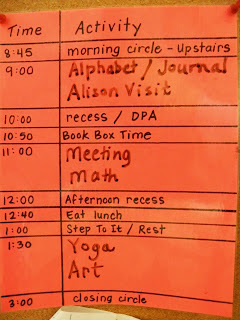 The teachers gave us insight in their daily schedules so we can work around their usual program. 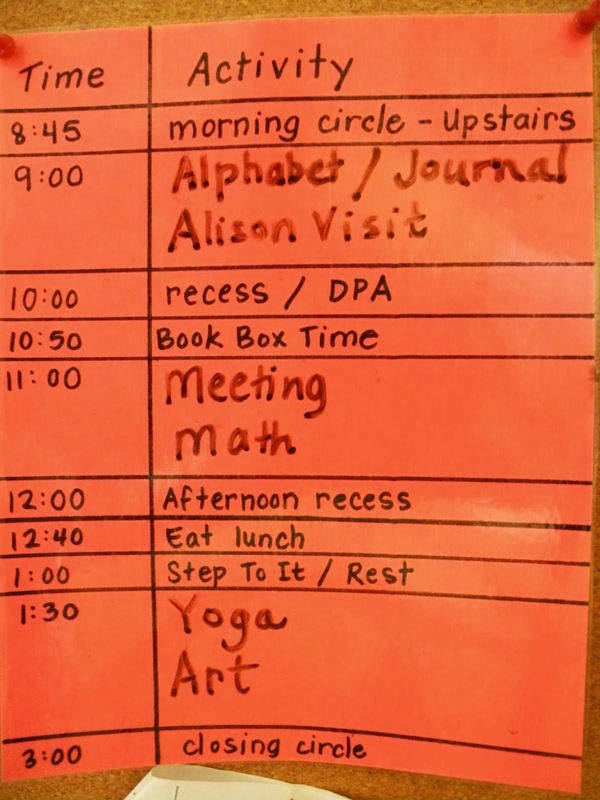 As we work mostly with Kindergarten children who have been in school for just a month, it's important to follow their basic routines, like morning circle, story time, Haida class and of course snack and recess. During our visit to the classrooms, one of the teachers (Ms. Sheila Karrow) mentioned that it would be nice for the children who are finished their projects early, to be able to play with some felt objects. This stuck with me and I was wondering how we could engage the children in some felt play. I came up with creating a felt play mat that incorporates the months of the year as told in Taan's Moons story, as well as the seasons of the year. As each class will only work with two moons/months of the story, they won't learn about the full dimension of the project until after all the work is finished. But with this play mat they will be introduced to the circular rhythm of the moon, the evolution of the months, the seasons and the year. This week I'm embarking on a new Artist in the Classroom project called Taan's Moons. Taan means bear in Haida language. In the book ‘Tluuwaay ‘Waadluxan’, Joanne Yovanovich describes the traditional Haida names and descriptions of each month of the year. The months were marked by seasons and food gathering times and carry names like Taa Halxa Kuu.ngaay - food gathering month, May, Ts’uu K’al WiiGuuxaay Kuu.ngaay - cedar bark weaving month, September and Taan ChaaGan K’aadii Kuu.ngaay - bear hibernate month, November. Alison Gear, a local writer and early learning coordinator, was inspired by these descriptions and wrote a poem called Taan's Moons, describing twelve full moons through the eyes of a bear. The poem brings to life the activities that happen each month on Haida Gwaii, traditionally and currently. Alison invited me to embark on a creative journey with her to find a way to illustrate her poem through felt creations with the help of the children of Haida Gwaii. We brainstormed and came up with a plan to work with the Kindergarten classes of the six elementary schools on Haida Gwaii this Fall. We received support from Literacy Haida Gwaii and School District 50 and applied for a grant from ArtStarts in Schools. Earlier this month Joanne Yovanovich, Principal of Aboriginal Education, Beng Favreau, Executive Director of Literacy Haida Gwaii, Tawni Davidson, Early Learning Coordinator and myself joined Alison for a Sharing Circle. This meeting was held to acknowledge that we're working with traditional knowledge and to become grounded in an understanding of what we're doing and why. We shared our hopes, goals and visions for the project, we talked about the role of elders and traditional knowledge holders within the project, and brainstormed about activities in the classrooms. This week Alison, Tawni and I will be visiting each school for a brief introduction of the project, to meet the teachers and children and to engage them in their first creative explorations of the Taan's Moons story. ArtStarts in Schools is a BC based organization that brings artists into the classrooms through their Artists in the Classroom Grant program. Teacher and fellow artist Sheila Karrow, brought this wonderful organization to my attention when we were brainstorming about a project that turned into the The Giving Trees of Haida Gwaii. In 2012, thanks to being awarded an Artist in the Classroom grant, I was able to work at Sk'aadgaa Naay Elementary School on The Giving Trees of Haida Gwaii project and be paid as an artist in residence! The project and final results were received with so much enthusiasm by ArtStarts, that they wanted to feature the work as part of the 'Sense of Place' exhibit in their gallery on Richards Street in Vancouver. The work was displayed from October 2012 to April 2013, and when it came time to return the work, a team from ArtStarts in Schools decided to hand deliver the work personally back to Haida Gwaii. The Giving Trees of Haida Gwaii from ArtStarts in Schools on Vimeo. And now, with the help of a large grant from ArtStarts in Schools, I'll be involved in a new felting project, called "Ta'ans Moons" at all six elementary schools of Haida Gwaii this Fall. I'm so grateful!